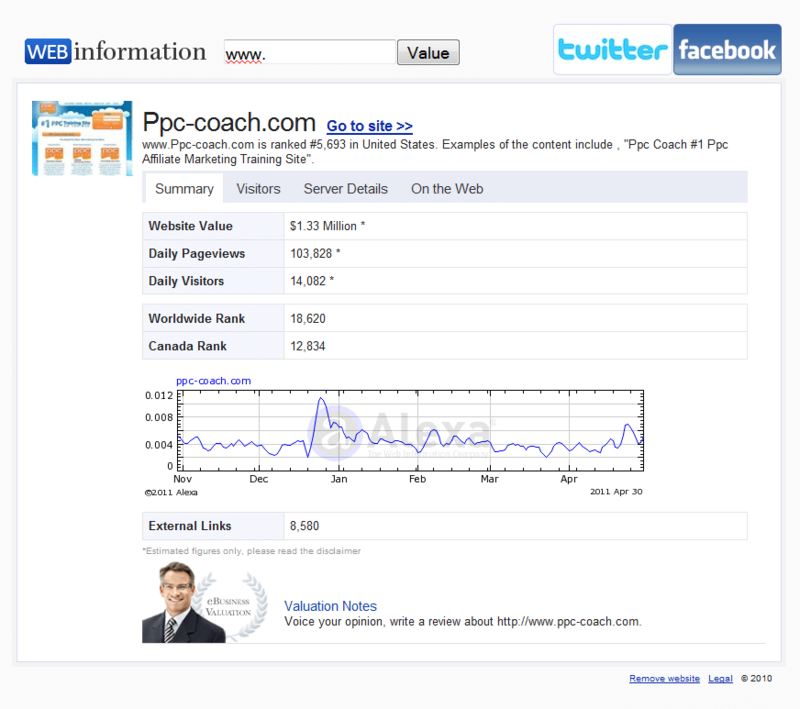 Well according to this site: http://webinformation.co/www.ppc-coach.com it’s worth $1,330,000. So first guy with that cash in a briefcase delivered to my door takes it! After all those “guess the value of a site” sites are 100% accurate and would never be off the mark. I heard business brokers use them to valuate sites all the time. (or maybe not). So I just don’t think we can rely on external sites like that one to valuate a site. After all, they’re just going on traffic and age primarily. They don’t account for anything else that I know of. While I’ll never reveal how much money PPC Coach makes, I can say that I probably wouldn’t ever sell it anyway. I enjoy it too much. It’s too much fun and it never feels like work to me. I have had offers on the site. Some were laughably low, others were very high but I didn’t take any of them. I’ve got too much time and effort investing here to give it up to anyone. 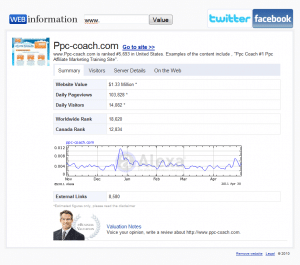 It would take an astronomical offer to get me to sell PPC Coach. Anyhow, I just thought that site was amusing and it was sent to me by my buddy Sean, who was surfing around looking at another sites value. We both know those sites are interesting but never 100% accurate. I love hearing success stories. So if you’ve ever sold a big site before, let us know in the comments below. I’ve heard of the million dollar sales before. Everytime I do, the first thing I do is run out and see what niche it was in and if I could build a site like that successfully. (I know most people do that too, so don’t lie). I think the sites that sell best are the ones that don’t have any key person involved. With PPC Coach, there would have to be a replacement for me if someone took it over. I know there are people who could do it, but it shrinks the marketplace dramatically. I think big corporations want to buy virtual real estate that involves very little outside management. They prefer to buy sites that produce organic traffic so that they can sell banner spots on it. Nothing wrong with that, as it’s as old a method as the internet, (must be outdated LOL), but that’s how the big companies work. Now before I get a bunch of emails asking if it’s true. It’s not. This post is just a joke poking fun at “valuation” sites online, nothing more. So please don’t read into anything I posted as I post it in complete jest. PPC Coach isn’t going anywhere anytime soon. At least not with me at the helm!